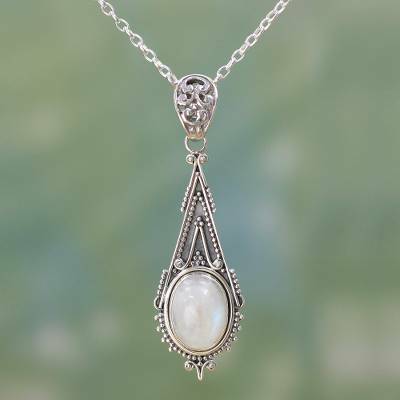 Crafted by hand, this beautiful sterling silver necklace showcases a single rainbow moonstone. Neeru Goel presents a stunning pendant that recalls classic art deco designs. I sent this as a gift to my daughter. I haven't seen it but my daughter was very happy and expressed how beautiful this piece of jewelry is. Thank you Neeru Goel for your beautiful products. "It looks like a cherished heirlom"